The webinar was great and contacting a few wholesale suppliers was not so hard once I wrote one message. One message became the main message I put into email and chats to every wholesaler I found after the first. It's only been a week but I feel overwhelmed with how many items I could add with my product designs. While also redesigning my theme and product display with more menus, drop lists, and pictures. The model photos are going to be significant. I need to find a staff member to hire and take on that role. We do something similar in Syncee. 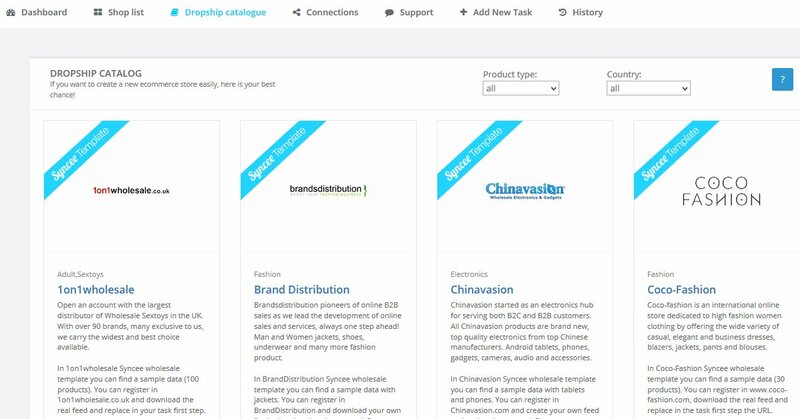 Our team created a free dropship catalogue what is available for our users. In this catalogue we collected several reliable suppliers. If you found the best for you and your business our app upload/update your products easily. Hi Corey, I watched the webinar and I´m starting to work on a dropship store. But one question arised about refunding. I live in Brazil and i think it would be more profitable (working with aliexpres) to sell products to Canadian or US consumers. Ali takes too long to deliver here in Brazil. How can I handle a situation involving a US consumer that wants to return the product? Any thoughts about it based in your experience? This is great idea for what I am looking for. I am from Vietnam, selling on Ebay for long time and now I would like to start my new oppotunity by opening the shopify store for selling both Vietnam product and dropship products.